As Bishop Gorman bids goodbye to Oregon-bound Darriel Gaynor, coach Sheryl Krmpotich can breathe easy. Her Gaels girls basketball team will be safely in the hands of Aaryn Ellenberg. 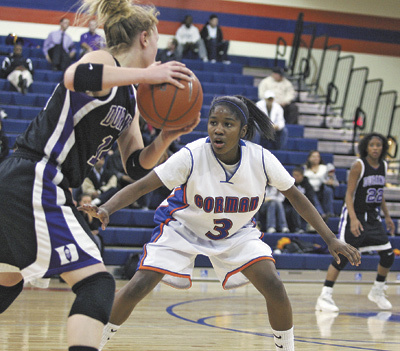 The sophomore guard had 20 points Friday night in leading top-ranked Gorman to a 70-46 home win over No. 4 Durango in a battle for first place in the Southwest Division. With Gaynor feeling less than 100 percent — she just called it an “off night” — Ellenberg picked up the slack, displaying a basketball IQ far beyond her years. (16-4, 6-0 Southwest) up 31-30. Rather than milk the clock, Ellenberg found herself open and shot. That swagger stayed with the Gaels — and with Ellenberg. In a four-minute stretch in the third quarter, Ellenberg had 10 points as Gorman stretched the one-point halftime lead to 57-35 entering the last quarter. But it wasn’t all Ellenberg. (20-3, 5-1) on both ends, with 16 points — 11 in the third quarter — and nine blocks. Understandable, given Lindy La Rocque’s hot hand. The Durango senior had 10 of her game-high 24 points in the first quarter, but Ellenberg played her tight the rest of the game. Contact reporter Jon Gold at jgold@ reviewjournal.com or (702) 380-4587.